I’m impressed by thoughtful design, especially when it’s broad in scope, going beyond functional to being exceptional. With this in mind, I’m feeling inspired enough to give a tip of the hat to one such project – a humble toilet. The bowl “is glazed with TOTO’s HYDROTECT titanium dioxide coating and zirconium, giving it a lovely iridescent, mother-of-pearl sensibility.” A glazing which, as it turns out, is really hard for waste to stick to. They’ve also integrated an advanced flushing capability….”which consumes a mere one-gallon of water per flush (gpf) for the full flush and .8 gpf for the light.” Its “Cyclone flushing technology” shoots two jets of water inside the bowl, which are both efficient and quiet. This toilet’s slightly taller than many others, 17” from the base to the seat-top, for ergonomic reasons, but they also make kid-sized toilets. 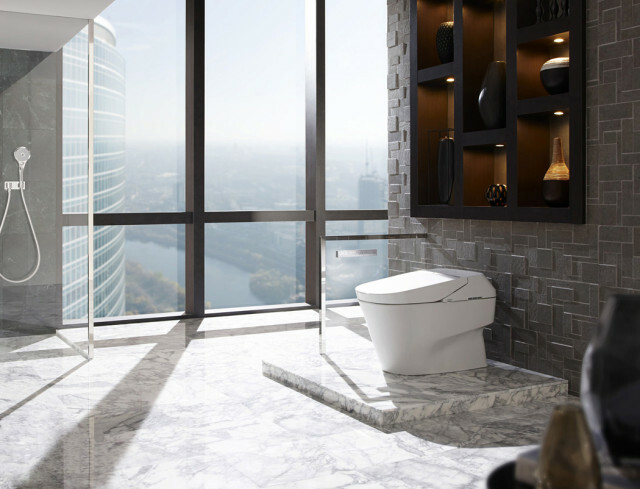 Depending on which model appeals to you, other features can include an integrated personal cleansing system auto-open/close, auto-flush features, noise-masking and undoubtedly much more. How many toilets have enough features to justify cheeky youtube videos? Which all leads me to believe they’ve given this a lot of thought. If we put a similar laser-like focus on every aspect of school and institutional design, imagine where it might get us?